alaTest has collected and analyzed 53 reviews of Samsung ATIV Book 9 Spin / NP940X3L. The average rating for this product is 4.8/5, compared to an average rating of 4.1/5 for other products in the same category for all reviews. Reviewers are impressed by the design and performance. The screen and durability are also mentioned favorably. There are some mixed reviews about the battery. We analyzed user and expert ratings, product age and more factors. Compared to other products in the same category the Samsung ATIV Book 9 Spin / NP940X3L is awarded an overall alaScore™ of 85/100 = Very good quality. The Samsung Notebook 9 Spin (NP940X3L) is a great windows laptop. The spin/tablet feature is especially helpful in meetings or in crowded space (e.g. airplanes) where you may not have the room or want the appearance of having a full laptop out. 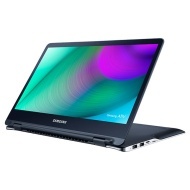 This SAMSUNG notebook is the BEST in regard to Power & Compactness. Reliability is also a big plus as are the whole line of Samsung products. Just bought my new notebook. It is very easy to use and has so many wonderful features. It also has outstanding display and sound. Researched a lot, bought this one. Bright display , Built-in speakers , Durable , Lightweight , speakers are loud! I've tried many, I can guarantee you that this device is the market best. The full package! this laptop has it all... Great power in a superb design!! Realistic color , Bright display , Built-in speakers , Lightweight , memory + ssd speed + no noise!? thin, durable, lightweight, fast, modern. I love it sooooo much!!! !